You may want to check your domains for this event as they may no longer resolve if not compliant. Test is available on the linked site. The current DNS is unnecessarily slow and inefficient because of efforts to accommodate a few DNS systems that are not in compliance with DNS standards established two decades ago. To ensure further sustainability of the system it is time to end these accommodations and remediate the non-compliant systems. This change will make most DNS operations slightly more efficient, and also allow operators to deploy new functionality, including new mechanisms to protect against DDoS attacks. DNS software and service providers listed on this site have agreed to coordinate removing accommodations for non-compliant DNS implementations from their software or services, on or around February 1st 2019. This change will affect only sites operating non-compliant software. Last edited by thecoalman on Fri Mar 01, 2019 2:04 pm, edited 1 time in total. Reason: This event has already occurred if you domains are working properly you are good to go. I've removed the link as it's apparently giving false results. Thanks for the reminder. Check my domains and all good to go. All OK. Not that one of my sites gets that much traffic anyway, it's mainly just for fun and testing. My company's internal I'm not even bothering since it's not internet accessible. We got a decent host as I can see. who are those people? not sure how accurate that is. I have several domains all listed under one main domain name as add-on domains. the main one shows slow and big problem. all of the domains under that one show as good. phpbb.com gives the same very slow big problem message . I must've spoke too soon because now my domain says it's slow. Yet I don't have any issues going to my site. Nevertheless, I'll bring it to the attention of my domain provider and see what they say. They rank Google as fast of course. Apple.com is slow as well. Last edited by John connor on Fri Mar 01, 2019 6:28 am, edited 1 time in total. I wouldn't classify CloudFlare as a DNS provider. They are merely a middle man so to speak. 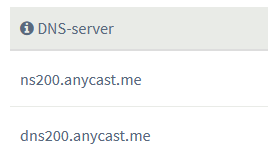 They are just a reverse proxy. Your domain provider would be where you bought your domain from. Whether that be directly with your host or a third-party like Namesilo, Namecheap or GoDaddy, etc. When you request a site sitting behind CloudFlare your request first goes to your domain provider, then your settings there route it to CloudFlare where they in turn route it to your host. The dnsflagday.net website does say CloudFlare will be making changes, but I use CloudFlare and my site still shows up slow. So it has to be Namesilo in my case. I have sent them an email. This event has already occurred and if your domains are working correctly it's no longer a concern. Why the slow error I have no idea but I'm getting same error and I didn't get that before. Ran a few speed checks on other sites and no issues. The slow error can probably safely be ignored. This test is totally wrong! I wouldn't classify CloudFlare as a DNS provider. Yes they would be, they aren't the man in the middle. They are part of a chain and in this case the final link. I believe it's accurate to say that if you have done all of the steps, you have switched over to using Cloudflare for your DNS services, too. Which "makes sense", given that one of the DDoS protections they're intending to provide is DNS flood protection, and they couldn't do that if you were still using your own DNS services. If you're on a plan where you've intentionally setup Cloudflare by just pointing your own existing DNS records to Cloudflare, the primary caveat is that they won't be able to provide any DNS service-level protections. This domain is perfectly ready, you do not need to worry about DNS flag day 2019.